Devised by Francesco Cirillo in the late 1980s, the pomodoro technique gathered many followers. The popularity of this time management method lies in its simplicity: work on a single task for 25 minutes and then take a 5-minute break. After four 25-minute sessions, take a 15-minute break. Not exactly rocket science. 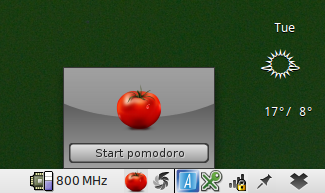 The only thing you need to practice the pomodoro way of working is a timer. You can use a kitchen timer, or you can opt for a more high-tech tool like Tomighty. Similar to an analog timer, Tomighty is not a particularly sophisticated tool. Once activated, it sits in the system tray counting down time. When the time is up, it displays a notification. You can modify the default time periods as well as change default sounds, or disable them altogether. Tomighty is written in Java, which means that you need the Java Runtime environment installed on your machine to make the utility work. Tomighty is distributed as a single .jar file, so there is nothing to install. Make the file executable, then double-click on it to launch Tomighty. I'll wait your feedback! thank you. I use the following ruby script as a timer on my mac. I have it in a file called timer.rb and run it with a parameter that represents the minutes to count down. When it reaches the end time it runs a Growl message. It's nothing fancy and could be made into a one liner, I'm sure.